A recent high-profile crime right in our neighborhood made us wonder: What would we do? What should we do? if we were potentially facing a criminal in the workplace. 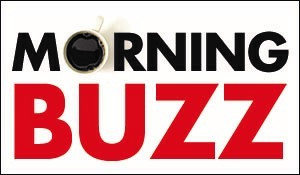 That very question prompted Buzz editor Joni Hoffman to invite Bellaire Chief of Police Byron Holloway and Rania Mankarious, executive director of Crime Stoppers of Houston, to come together and provide some answers. 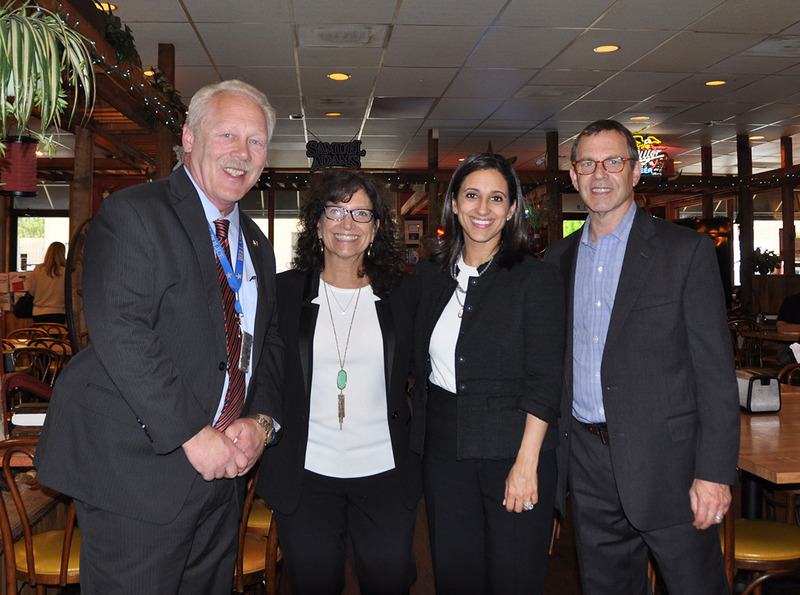 Buzz advertisers, supporters and friends gathered over BBQ from Charlie’s BBQ yesterday to hear from Chief Holloway and Rania Mankarious on this topic. We appreciated the fact that these busy business owners took time from their packed days to listen and ask smart, important questions. 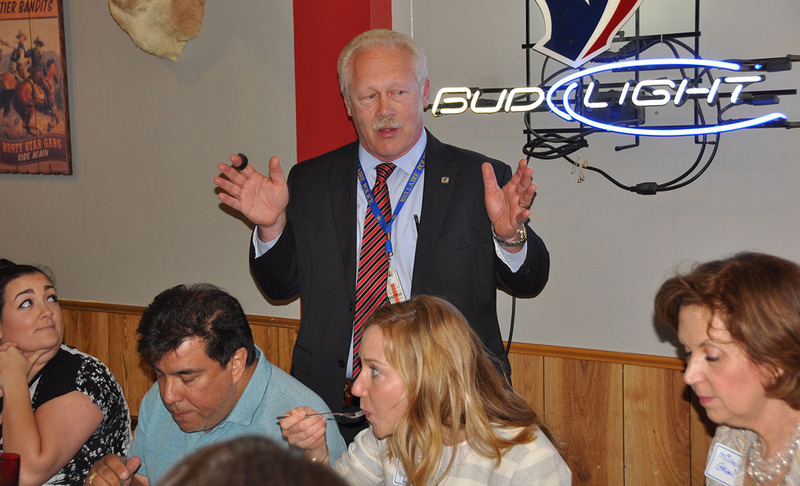 Chief Byron Holloway suggested that business owners put themselves in the mind of a criminal. Walk around your business and consider potential weaknesses. Chief Holloway said it’s important to consider how to create a safe environment, both for your employees and for your customers. He discussed ways to secure your business and to be aware of your location, your internal security and your physical security. Contact the Bellaire Police Department and they will come to your business and assess its safety and help provide tips for making it safer. Contact: Community Resource Officer John Edwards at 713-662-8103. He said the priority is to get the robber out of the establishment and remove yourself from a potentially dangerous situation. If you can’t, you should be prepared to fight to defend yourself. But the best thing to do is to be as proactive as possible to protect your property and yourselves, including having cameras. Chief Holloway said that cameras won’t deter every criminal, but it’s important to have good cameras to help law enforcement and Crime Stoppers in the event of a crime. 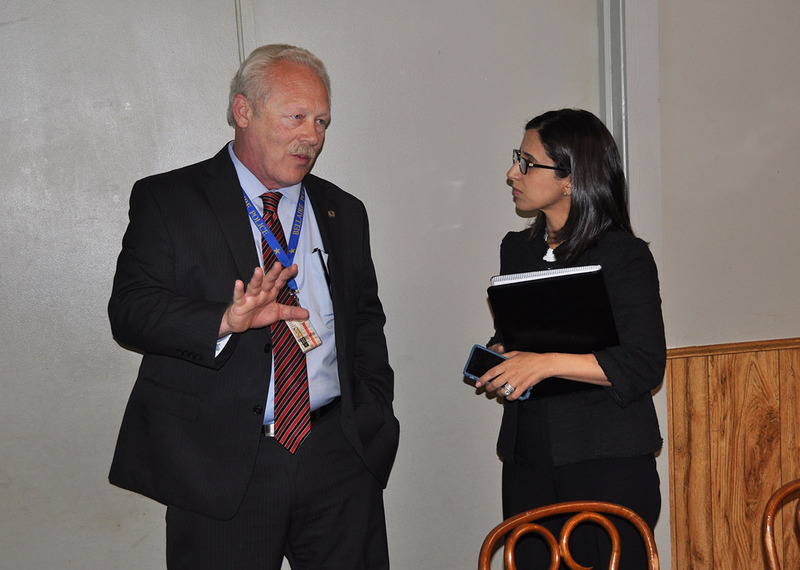 Rania Mankarious, executive director of Crime Stoppers, said that its anonymous tip line (222-TIPS) has helped law enforcement in solving over 33,000 felony cases resulting in the arrest of over 25,000 felony fugitives. And Crime Stoppers is more than a tip line - its prevention arm helps prevent many different types of crime within businesses, banks, homes, schools and more. Both Rania Mankarious and Chief Holloway suggested displaying signs– such as “No cash kept on premises” or a Crime Stoppers sign like this one – letting potential robbers know that your store isn’t a good target. 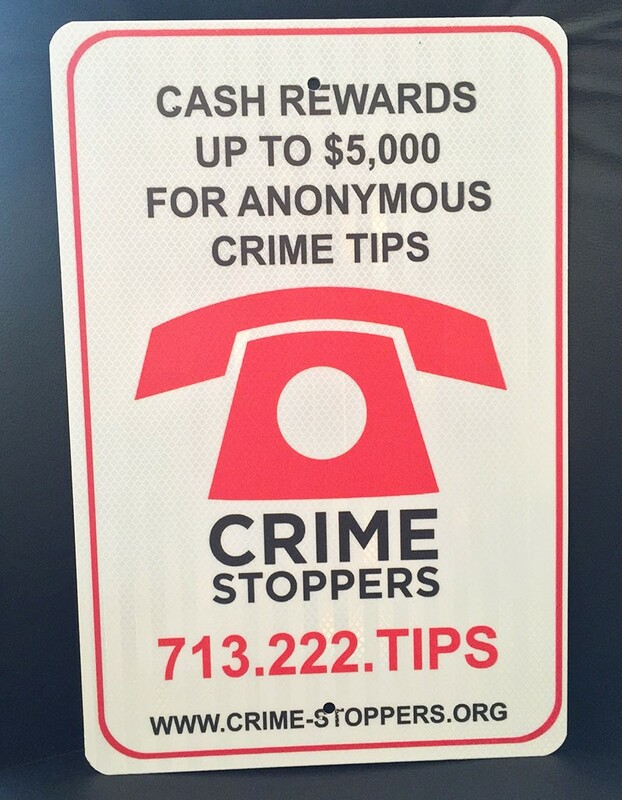 To become a business Safe Community Member and receive a Crime Stoppers metal sign, please contact Allison Lewis at 713-521-4600. 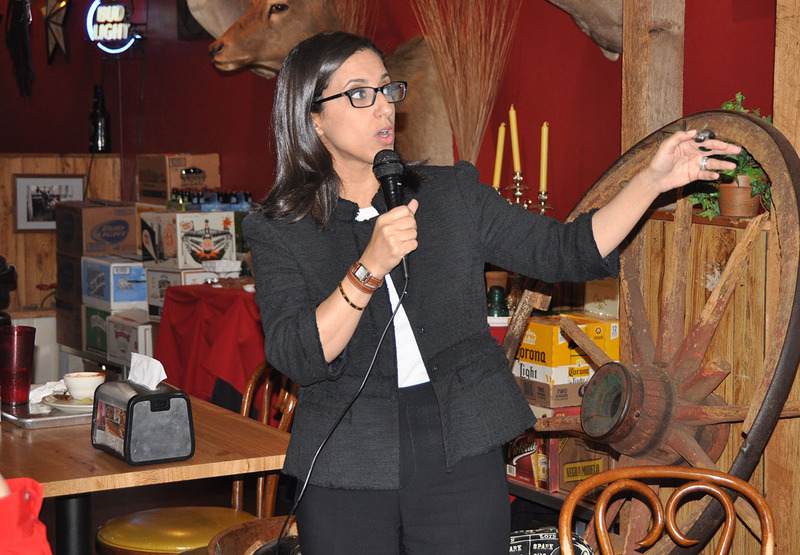 “I’m a mother of three, and will do anything to help protect my kids,” Rania said, explaining that criminal activity is changing, and Houston has the highest rate of violent crimes among all major cities in Texas. Rania also said it’s important to have conversations with staff members to discuss what to do in case of a crime. The important part is to stay calm and cooperate and the goal is to get the robber out the door quickly. What makes your business an easy target? Rania says cash businesses with late-night hours, young staff or mom-and-pop shops may seem like an easy target, so be sure to train employees and be as proactive as possible. We know there’s so much more to discuss on this topic. Please leave your questions and thoughts in the comment section below and we’ll be sure to pass them on to Rania and Chief Holloway. For any Bellaire businesses interested in having a security screening from the Bellaire Police Department, please contact Community Resource Officer John Edwards: 713-662-8103. Chief Holloway said they are also willing to assist businesses that are slightly outside of Bellaire in locating resources available to them.